There’s no point in leaving this until the end. You’ll sense it as you’re reading my review. 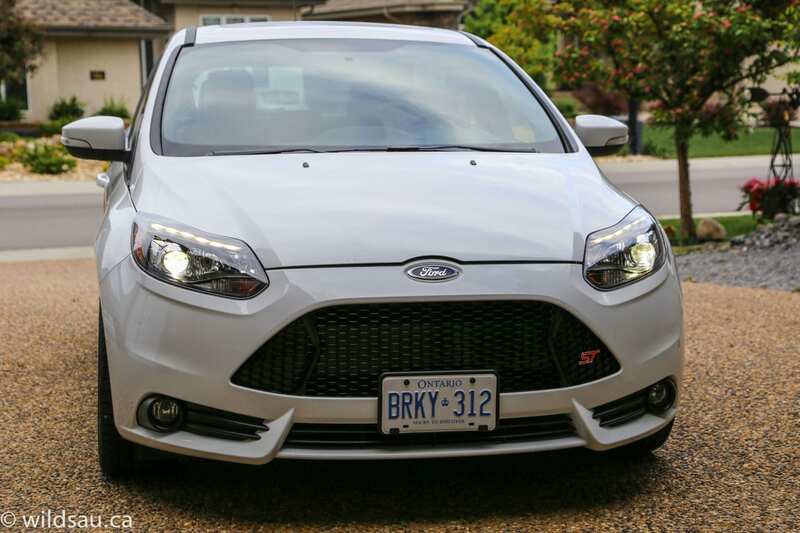 I had a blast during my week with the Focus ST. Is it a car I’d buy? With three kids and a wife that doesn’t drive a standard… YES, IT IS! Probably the best way to get some “me time” and get out on the road. 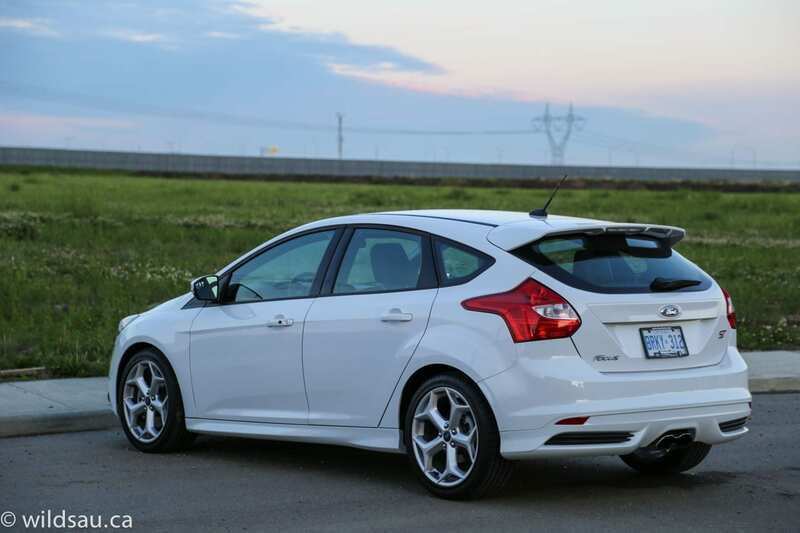 The Focus is Ford’s second smallest car in North America, one step up from the Fiesta. 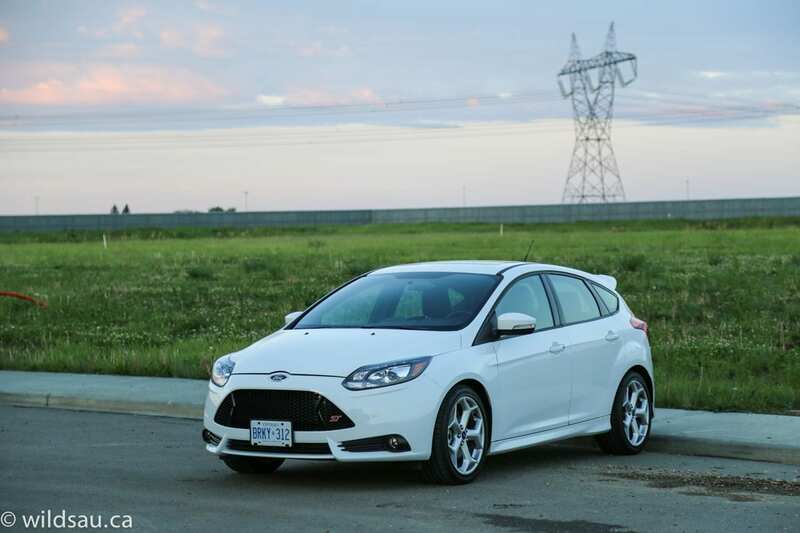 I’ve reviewed a loaded-up Titanium-trim Focus and loved it. It’s a smart car. 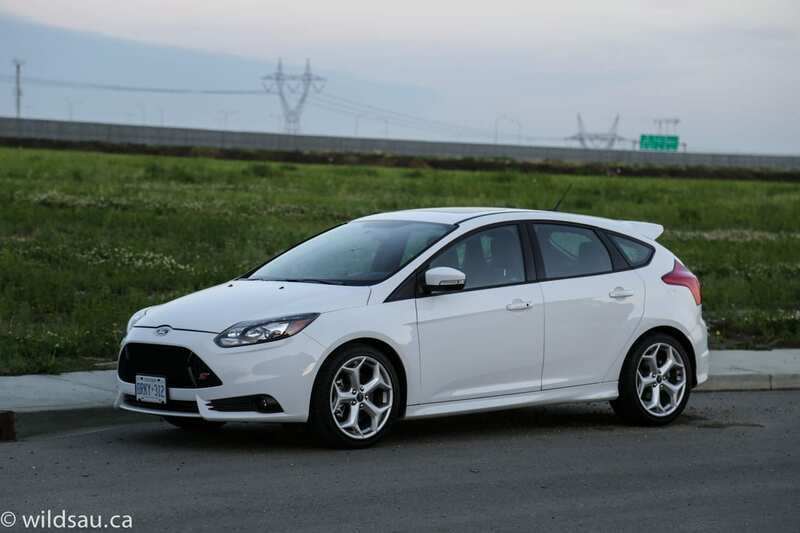 Ford has taken the already great Focus platform and made it into a performance car. 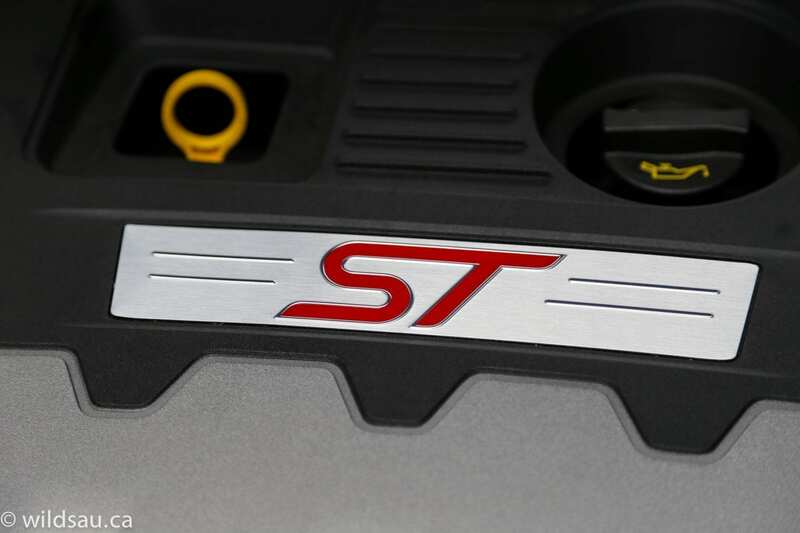 I hate this phrase, because it’s over-used, but the ST is a hot hatch. Do they jack up the power? You betcha. But it’s not just a bigger set of balls. 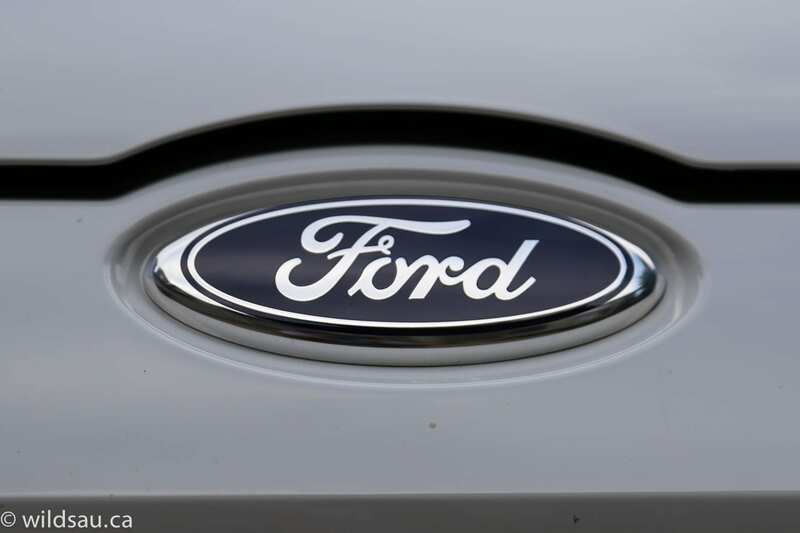 Ford has made plenty of changes that play out very well when you’re on the road. Here’s the biggest part of the story. 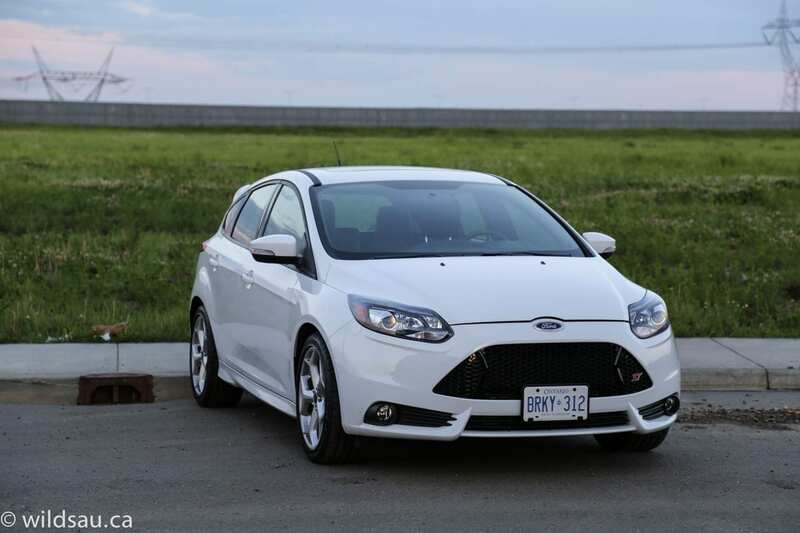 Ford tuned their 2.0-litre EcoBoost inline-4 engine (found in many other applications across their product line) to churn out 252 horsepower at 5500 RPM. 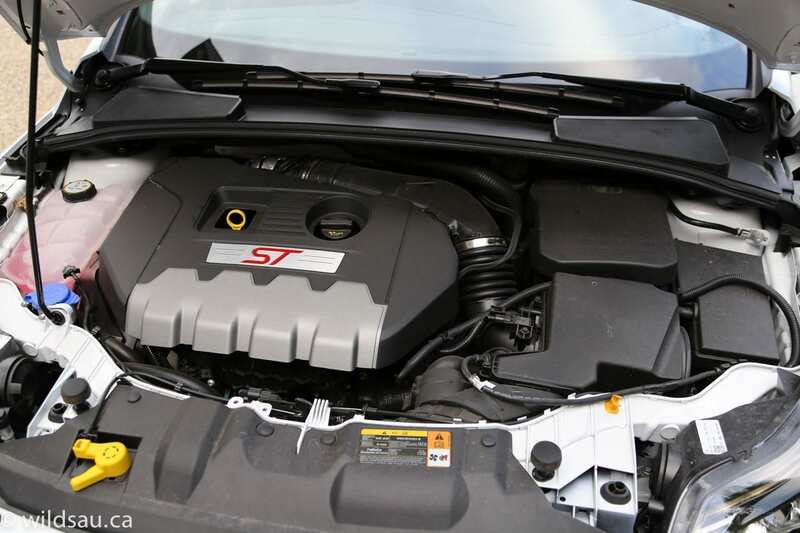 While that’s pretty awesome in a 3223 pound 5-door hatchback, the real story is the torque. 270 lb.ft of it, ready for you to get your foot into at a low 2500 RPM. That’s astounding, and it’s what makes this car’s character. The power makes its way to the front wheels via a 6-speed manual transmission. Fuel economy is actually quite decent. 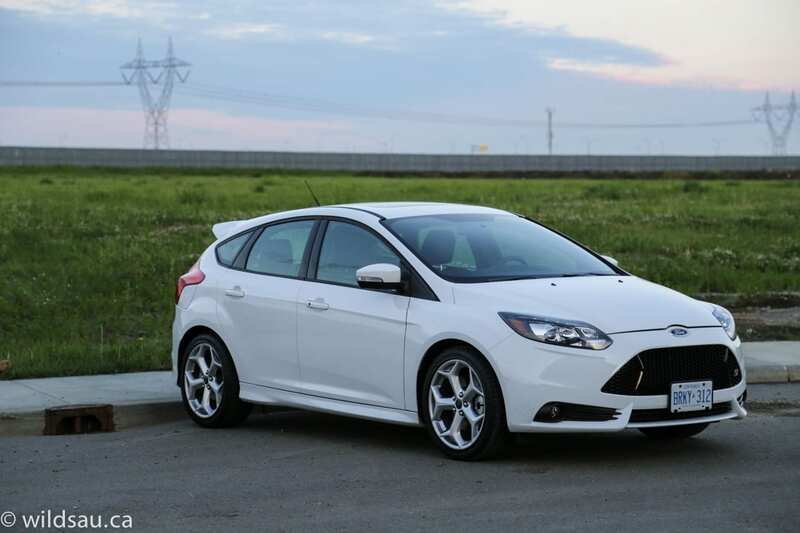 It’s rated at 8.9 L/100 km (26 mpg) in the city and 6.2 L/100 km(38) on the highway. Of course, that’s if you drive normally. There’s no way I was going to granny this beast for a week. I averaged 12.1 L/100 km (19 mpg) and was driving it hard. The fuel tank is relatively small at 47 litres. This car is all about driving. Let’s talk about the power. It has so much of it. 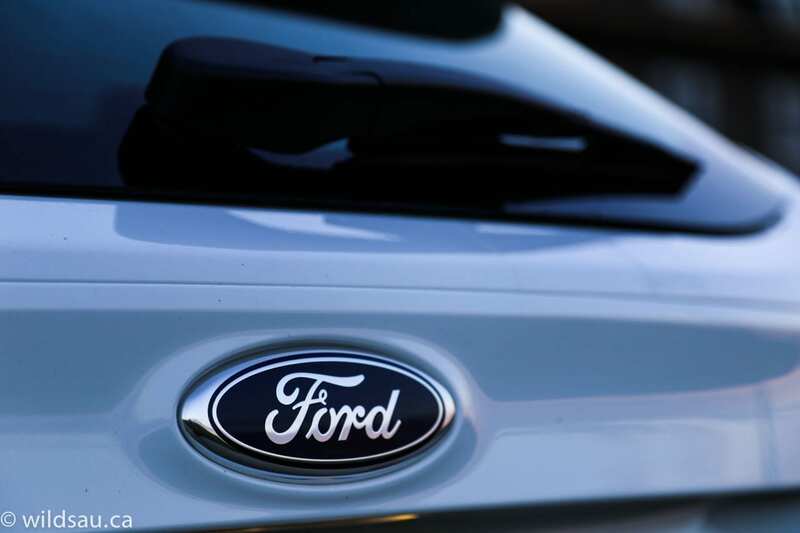 The EcoBoost engine builds its power so quickly that, even though there’s some turbo lag, it’s barely noticeable. And it’s smooth. The engine remains smooth all the way to the upper registers of the RPM band, and the same goes for the power delivery. It’s a very smooth curve once it’s on boost, and it revs quickly through the gears if you’re on it. It will push you back in your seat, and if you pin it, 0-60 mph (0-100 km/h) comes up in 5.8 seconds. All that creamy torque to the front wheels brings the age-old issue of torque steer to the game. And it’s here. It’s here quite often – every time you step on it with a heavy foot. But unlike torque steer of yesteryear, it’s limited to a little wiggle in the steering wheel. 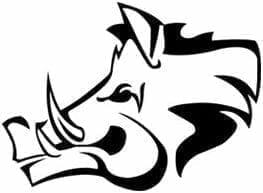 Once I got used to it, it became part of the car’s character and I appreciated that it was limited to this, rather than showing up at the front wheels, and squirming all over the road. The variable-ratio electric steering is excellent. It’s boosted perfectly at all speeds, making for easy turns at lower speeds and dialing up the effort as you drive faster. 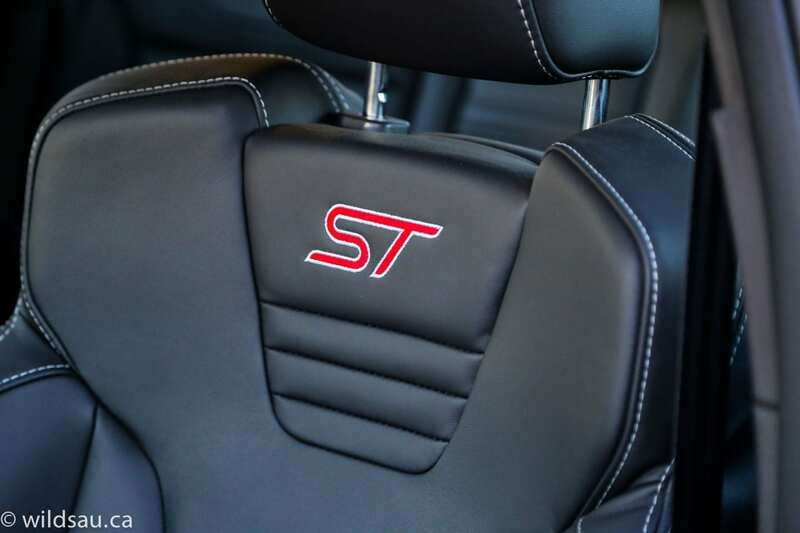 That’s only part of the magic that happens when you call on the Focus ST to deliver in the corners. 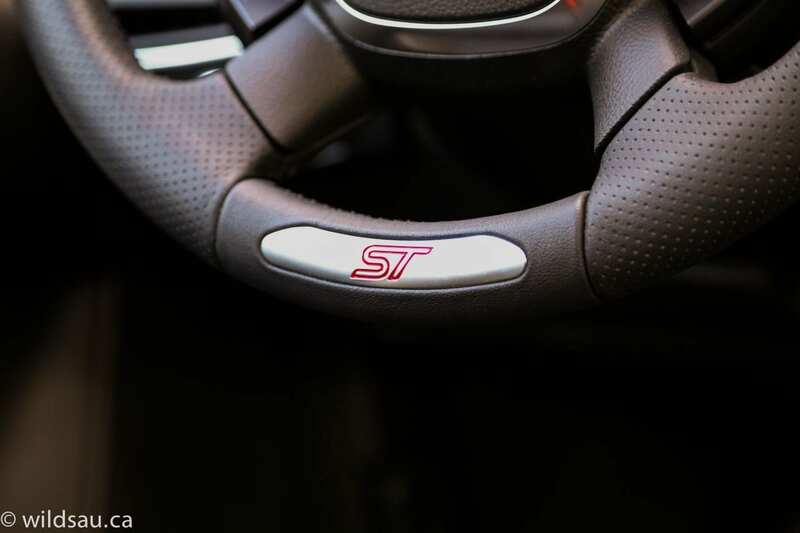 Ford’s torque vectoring brings some dark arts to the table, because through a clever combination of braking and electronics, they are able to make the ST feel as though it’s rotating around a corner much like a rear-wheel drive car would. It’s remarkable how well the front tires bite and how nicely the car rotates around the exact pivot point you’d expect. 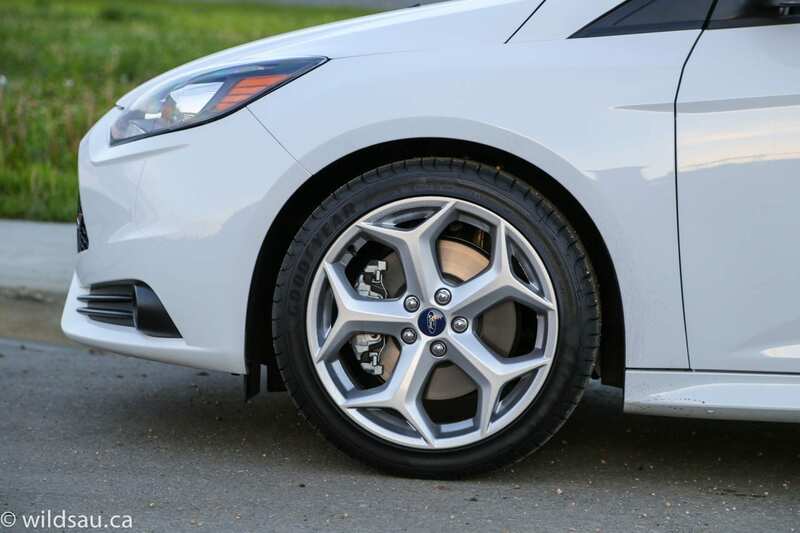 The secret is that Ford brakes the inside wheels a bit in a curve, which allows the outside wheels to continue pushing you through it. It eliminates the typical front-wheel drive understeer and helps this car grip the pavement more tenaciously than you might imagine. Throw in the grip from some downright impressive rubber (235/40-sized Goodyear Eagle F1s) and you have a recipe for truly extraordinary handling. It stays flat, it hangs on and dang it if it isn’t fun! All this handling prowess obviously comes with a compromise in ride quality. Yet it’s not bad at all! It’s firm, to be sure. But it never, ever got harsh – even on Edmonton’s brutal side streets. The worst it ever got could be described as jiggly, and in my opinion, it’s one of the best-sorted sport suspension set-ups on the market. Getting the power to the front wheels is easy. The gearbox isn’t the slickest thing in the world – Honda still has Ford beat here, but it’s a great box nevertheless. And in terms of controlling it, they’ve really put a fantastic clutch in place. 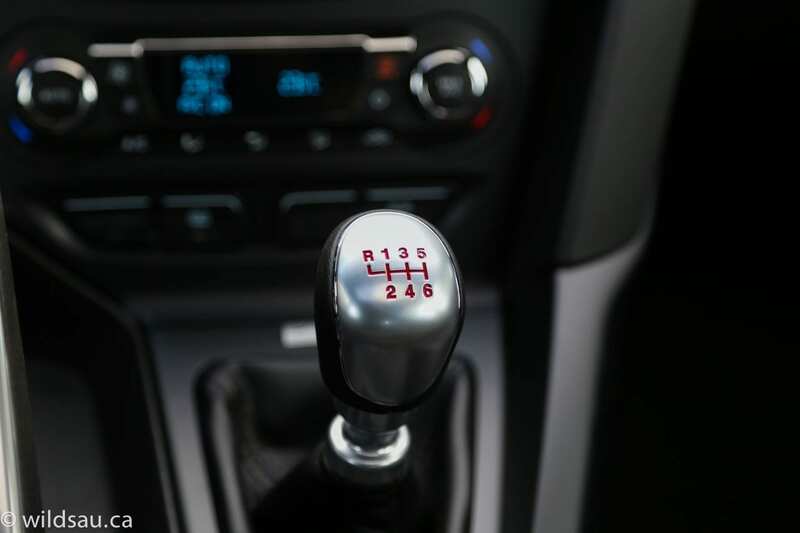 It allows you to shift in a relaxed manner for daily driving, yet it doesn’t balk when you’re banging through it with hard and fast shifts. The brakes are fierce. Driving the ST off the lot was an adventure, because I hadn’t tested the braking. I needed to make a quick stop as traffic was coming, so I touched the brakes… and almost launched myself through the windshield. After my heart rate returned to normal and I cleaned out my shorts, I adjusted my braking effort and carried on. Suffice it to say, they’re powerful and effective. Visibility out of the Focus is pretty good, except for the slightly constricted rear view. I’ve talked up the performance characteristics at length here, but I should mention that the car is very easy to drive on a daily basis. 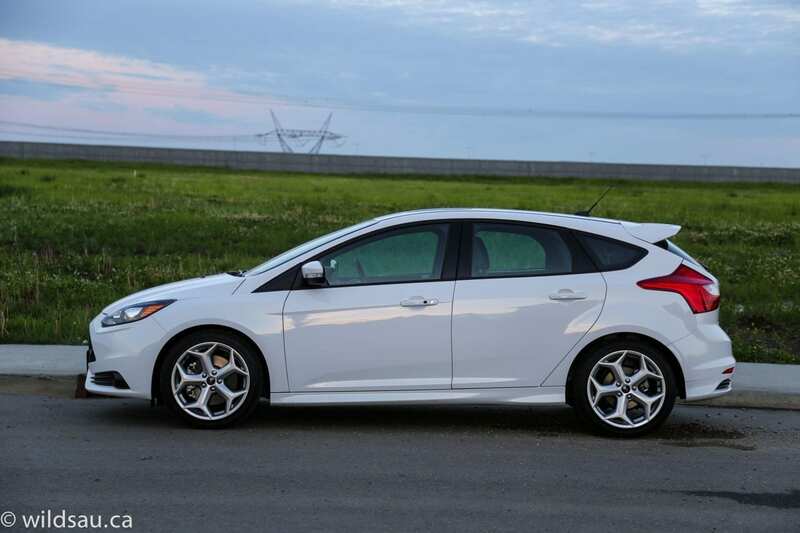 It’s a fantastic commuter car – comfortable and smooth. 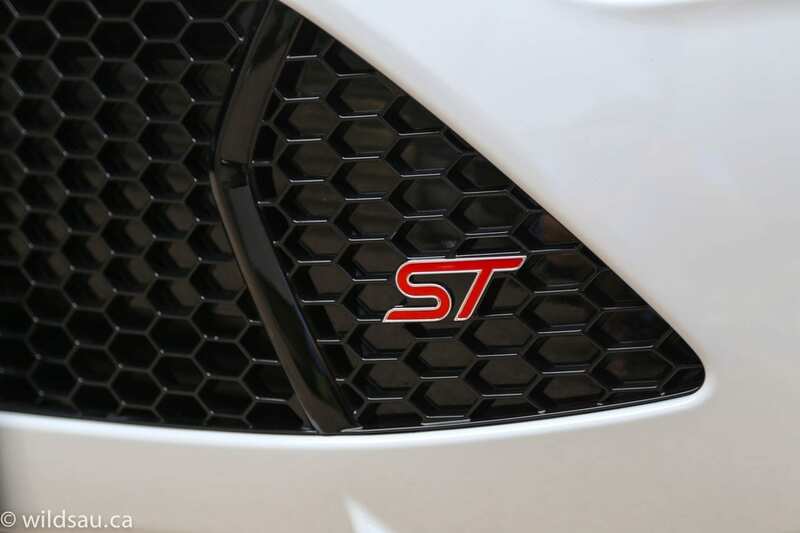 Perhaps my biggest take-away from the Focus ST’s driving experience is how playful it is. It absolutely plays along. Throw anything you want at it, and it happily takes it on and asks for more. I’m not exaggerating when I say driving the ST is the most fun I’ve had in a front-wheel drive car. I quite like the current generation of Focus’ styling. 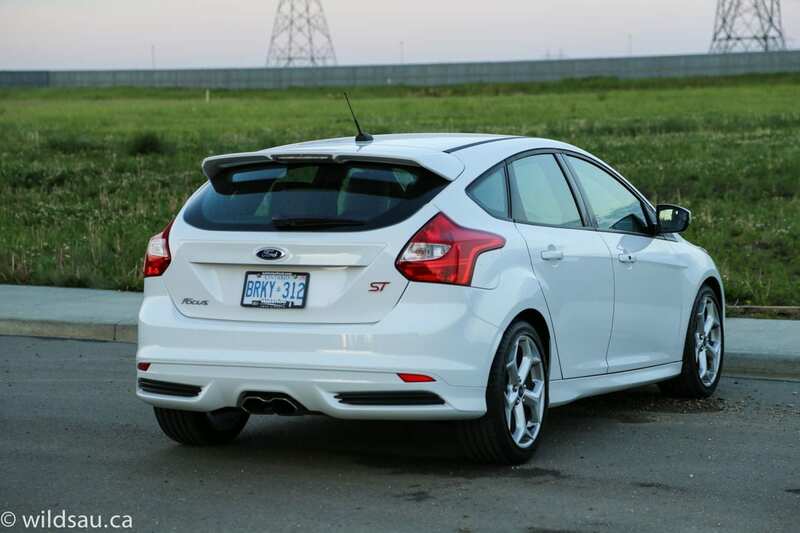 Ford has done a good job of making the car look upscale and the ST takes things from there and moves it up a notch. 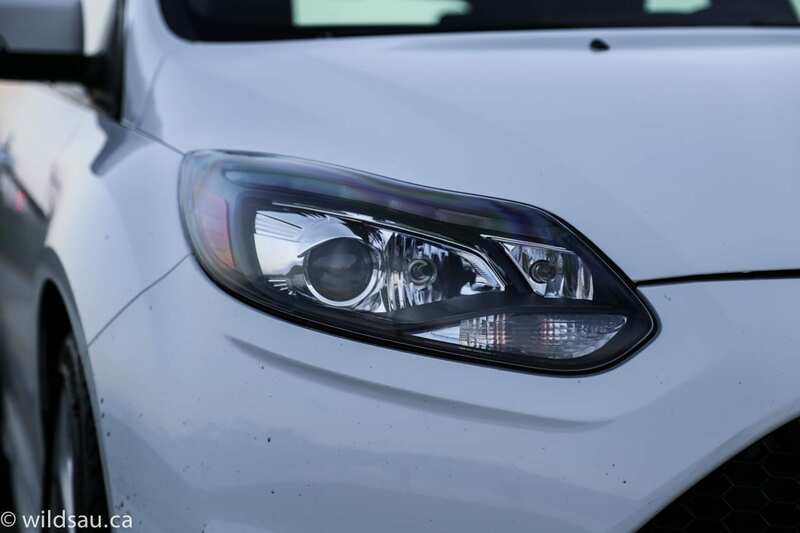 There are a few clues on the exterior that you’re in a special Focus. A unique grille with honeycomb mesh and glossy angled-bar vertical details. Nice HID headlights with a strip of LED running lamps. Out back, you’ll find a revised rear fascia and a noticeable but not ridiculous roof-mounted rear spoiler. And the finishing touch? 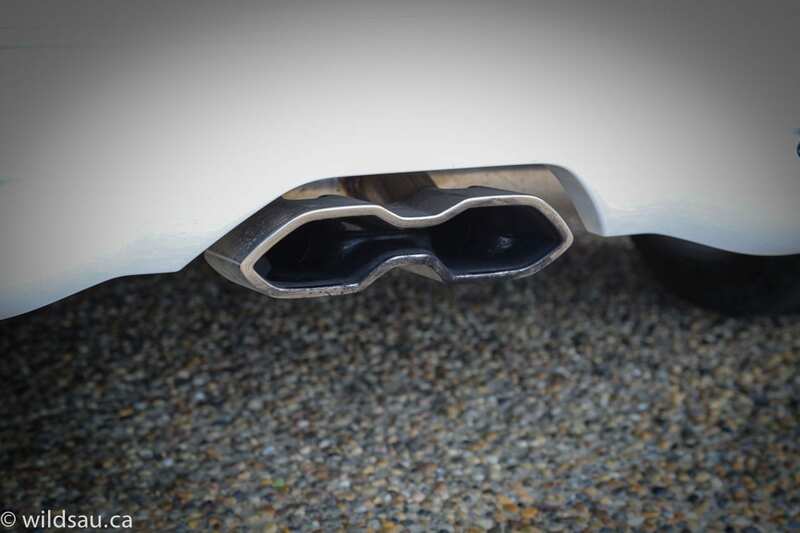 A sweet-looking center exhaust. Filling the fenders are beautiful 18″ Y-spoke rims that add as much aggression as they do style. 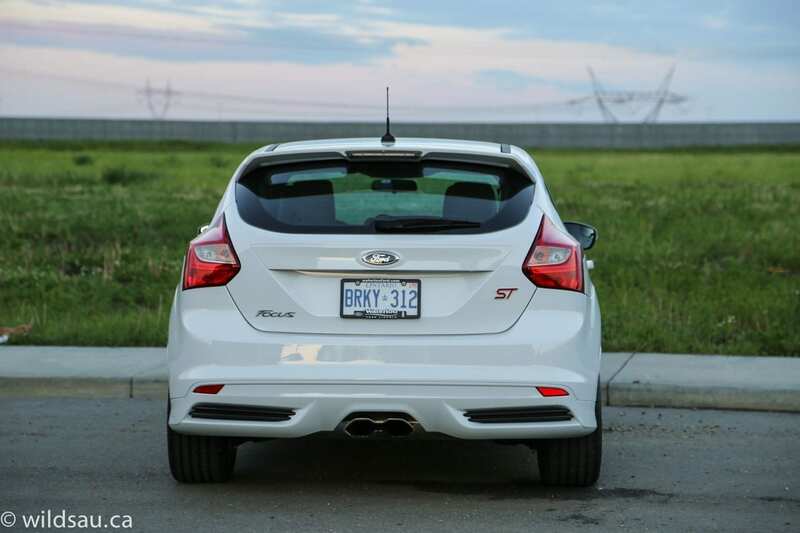 The ST has a lowered stance – just enough to make it look aggressive and not silly. I think Ford did a nice job in taking an already-handsome Focus and adding just enough touches to make it different without going overboard. It’s not a car that screams “Look at me!” (unless you get it in the Tangerine Scream paint, of course) but it does set itself apart from its stablemates. 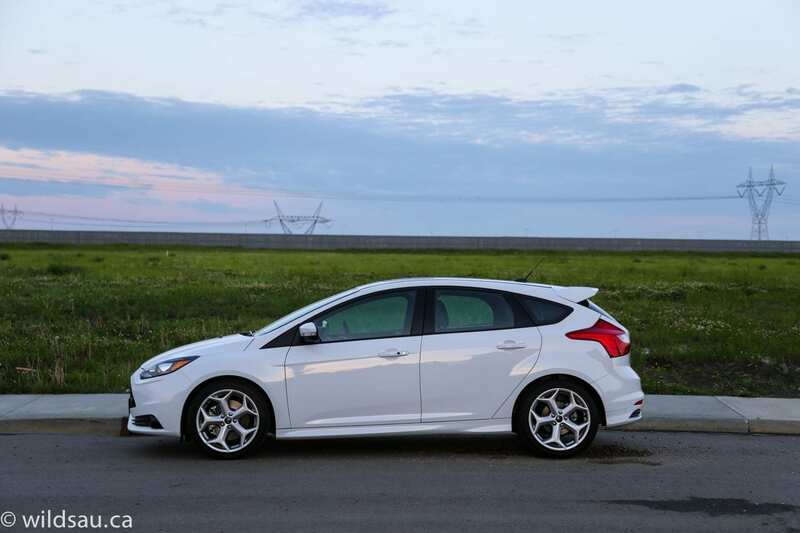 Inside, Ford has done little to distinguish the ST from other Focuses. Focii? Whatever. That’s not necessarily a bad thing, since the Focus interior is a nice place to be. 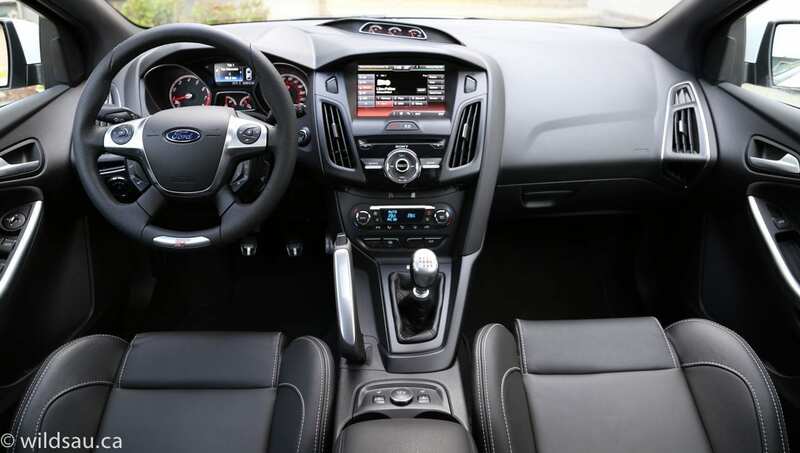 The materials are upscale, with soft-touch plastics making up the whole dash. Fit and finish are quite good. It’s not a big cabin. Headroom is fine for me at 5’10” but taller drivers might find it snug. The most obvious difference is the seating. 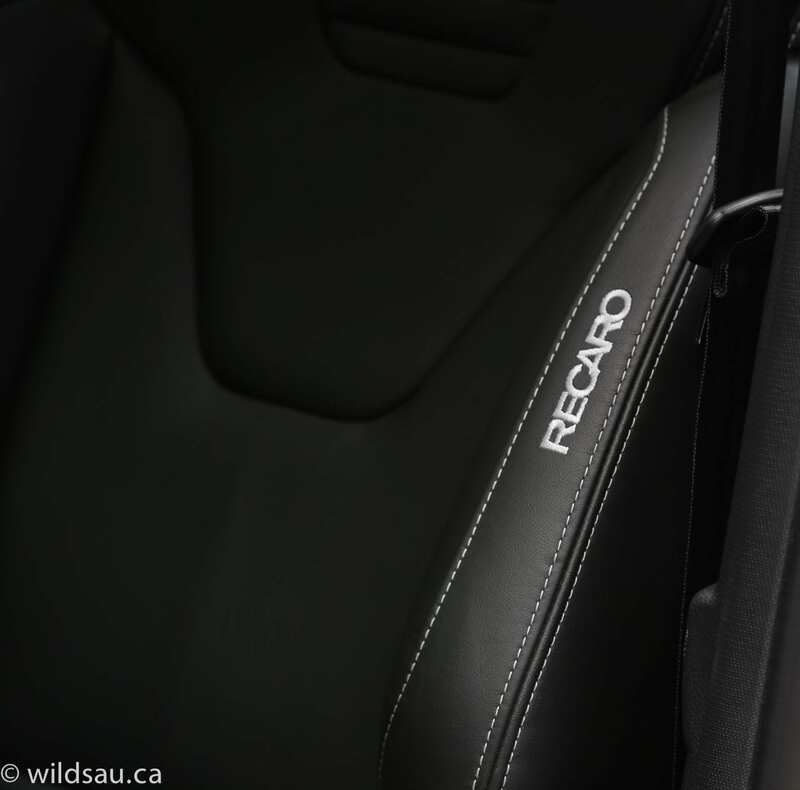 The gorgeous factory Recaro racing seats are exceptionally comfortable and unsurpassed in terms of support. They hug you almost inappropriately in corners. They’re heated and the driver’s side is power-adjustable. Though I found them comfortable, I did have a couple of complaints from others, who said the lower seat cushion was at a strange angle for them. You also get a unique steering wheel (it’s great to hold, manually-adjustable and has all the standard controls for the driver information screen, media, phone,handsfree and cruise on it), sporty-looking pedals, a unique shift knob and ST-specific brushed chrome sill plates. 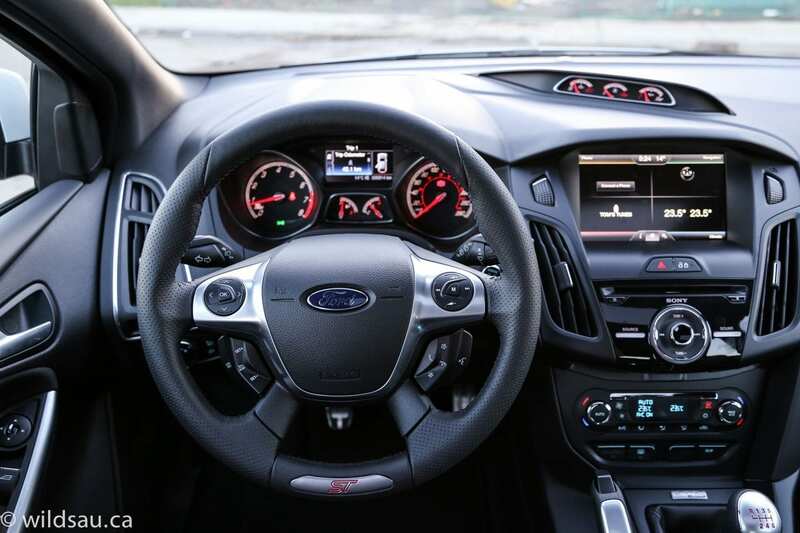 Behind the steering wheel sits a ST-specific set of gauges. They look cool, but the font they used isn’t particularly easy to read, especially on the speedometer. Best to ignore it then, and just have fun. 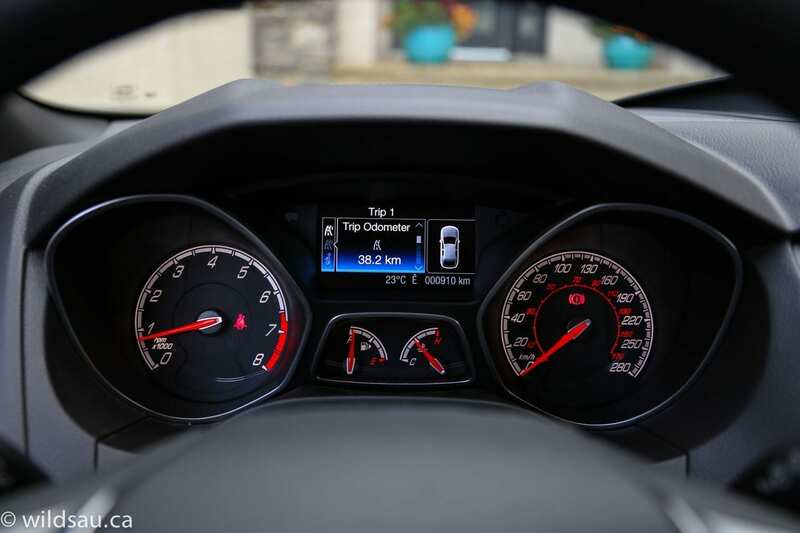 The gauges surround a central driver information screen, which handles trip meters, fuel economy information, vehicle settings, etc. 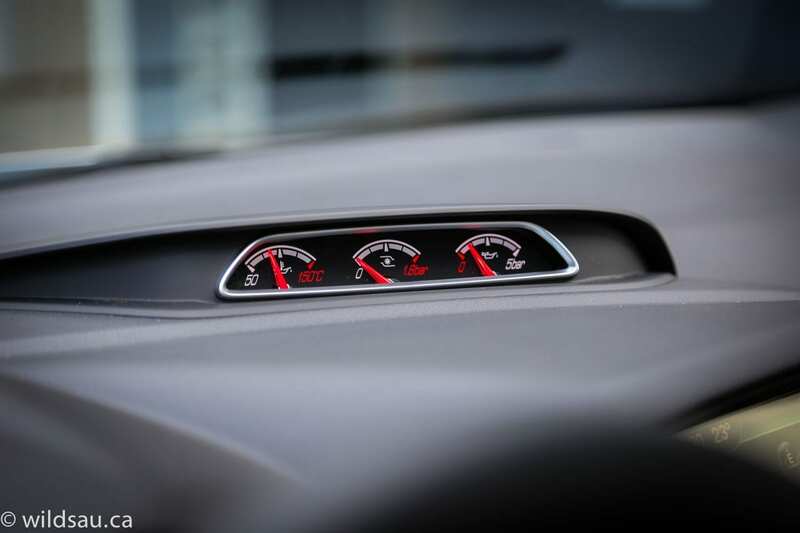 Oh and speaking of gauges, there’s a small eyebrow bin that juts out of the center of the dash, housing three additional gauges including a boost gauge. Otherwise, it’s pretty standard fare. The top of the stack holds the MyFordTouch screen – below it is a circular button pad with a rotary knob in it, handling major functions. The screen manages your media, phone, navigation and climate control displays. 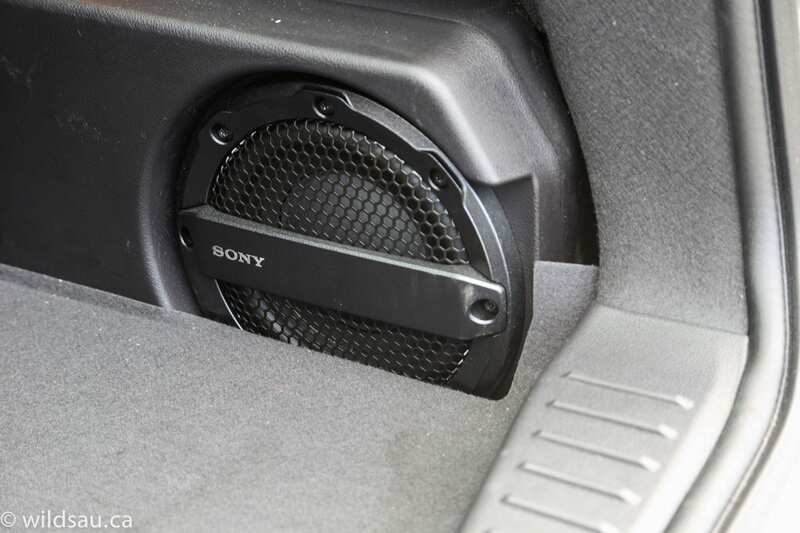 The sound system is Sony-branded, feeds off of AM, FM, satellite, CD, USB and Bluetooth-streaming audio sources and sounds fantastic. 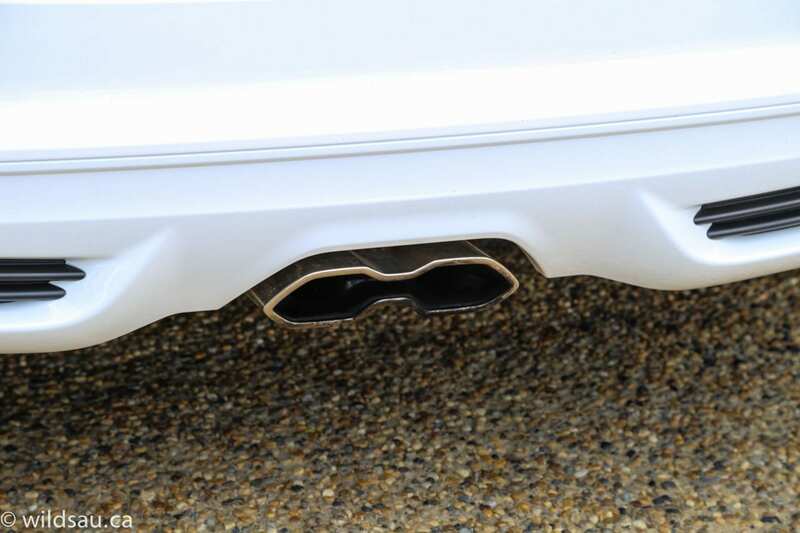 It has fat bottom-end thanks to the trunk-mounted subwoofer. Below the media system is a dual-zone automatic climate control system. The center console is home to the shift lever, a traditional parking brake, a 12V plug, two cupholders and an armrest. Overhead is a small powered tilt/slide sunroof. You’ll find three seats in the back, each with a seatbelt and a headrest. But let’s be honest – you’ll only want to use the two outboard positions, as the middle one is narrow, hard and raised and straddles a nasty tunnel on the floor. Those two main seats are very comfortable. I found there was enough leg and foot room for me to sit behind myself (again, I’m 5’10”) but head room was barely enough. Taller passengers will feel differently and things will start to get cramped. There’s a 12V plug at the back of the center console, decent little door bins and two seatback map pockets. The middle seatback folds down to become an armrest with a couple of cupholders. Our three kids were uncomfortable in the back due to the width (or lack thereof). You do get two sets of LATCH anchors for kids’ seats, and it’s just fine for two of them. There isn’t a whole lot of places to put your stuff. The glove compartment is reasonably big, door bins are usable and there’s a bin under the armrest lid – you’ll also find your USB plugs in there. Of course, you can always make your way to the back of the car. The sizable trunk holds 674 litres. There’s a hard parcel shelf/tonneau cover that swings up and out of the way with the trunk lid. 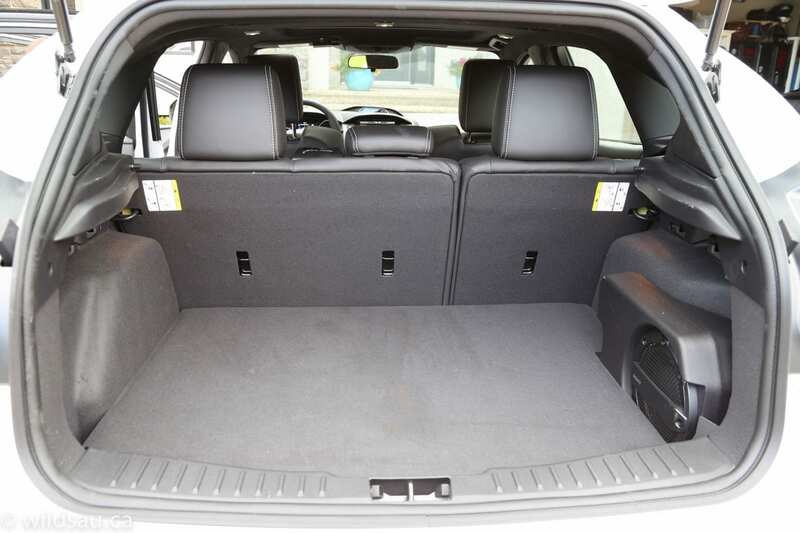 Fold the rear seats down (they split 60/40) and you end up with 1269 litres, which is a respectable cargo space. 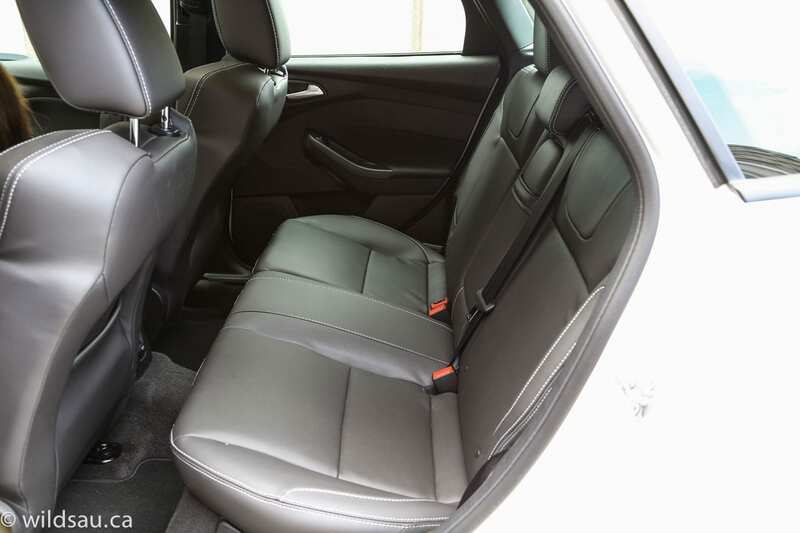 Of note, you’ll need to tumble the seat bottoms forward first, remove the rear headrests and then fold the seats down if you want them to fold flat. The trunk lid can be popped open (but it’s not a powered lift-gate) from the dash or the key fob. 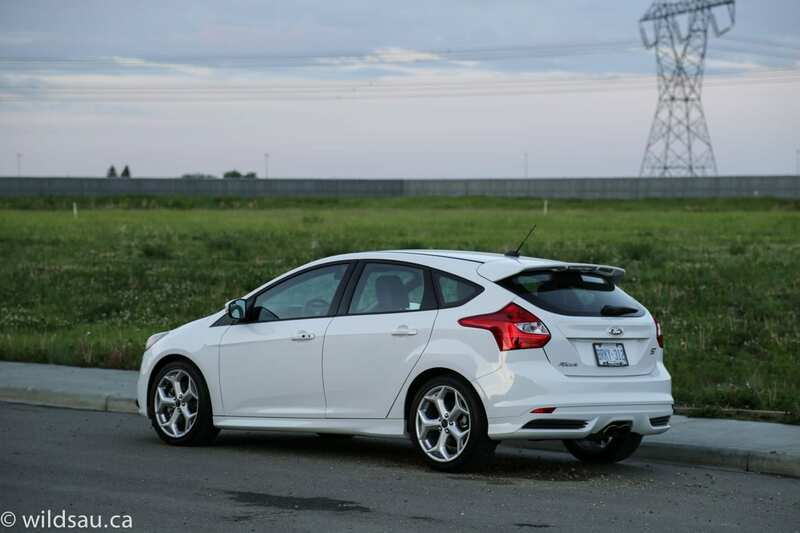 The one thing that drove me absolutely crazy about the Focus was the turning circle. Honestly, it’s one of the worst I’ve ever experienced. I don’t know what went wrong here, but when I was trying to pull into a parking spot in a parkade, it turned into a 5-point turn adventure where another, much larger car would have let me pull into the spot without ever having to put it into reverse. It’s really bad. And irritating. 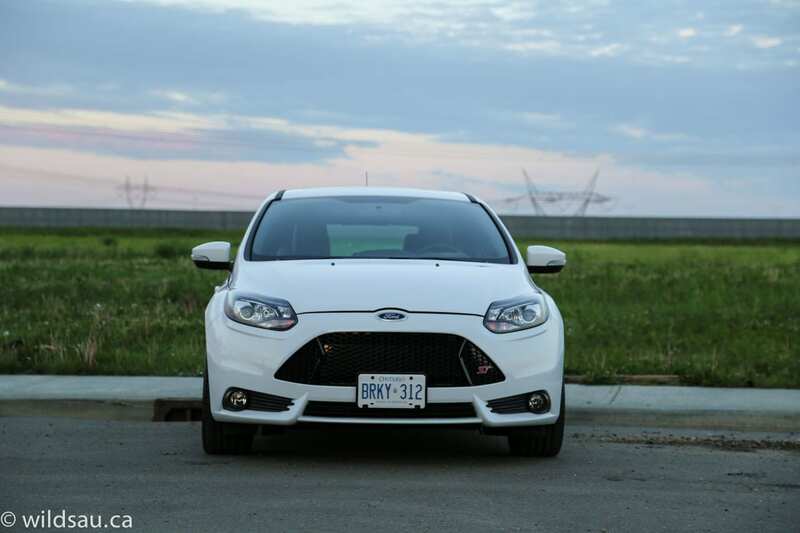 I didn’t like that this top-of-the-line Focus didn’t come with a back-up camera – a feature that the Titanium-trim Focus I reviewed had and I liked. 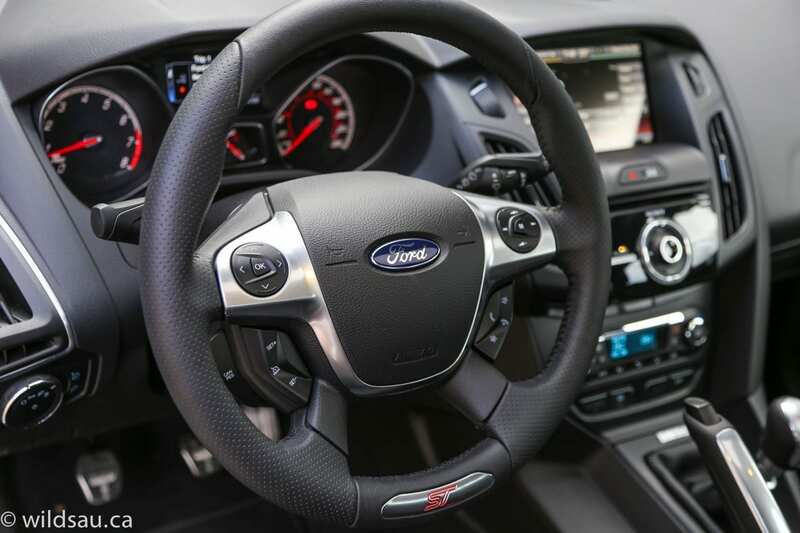 MyFordTouch allows you to assign up to 22 “favorites” slots to anything you want to call a favorite – phone numbers, radio stations, destinations for the nav system. This capability is augmented by two little buttons on the steering wheel. They are numbered 1 and 2 – tap either button and the system will act on your wishes – it’ll call that favorite number, go to that favorite radio station, pull up directions to that favorite destination. Pretty smart. 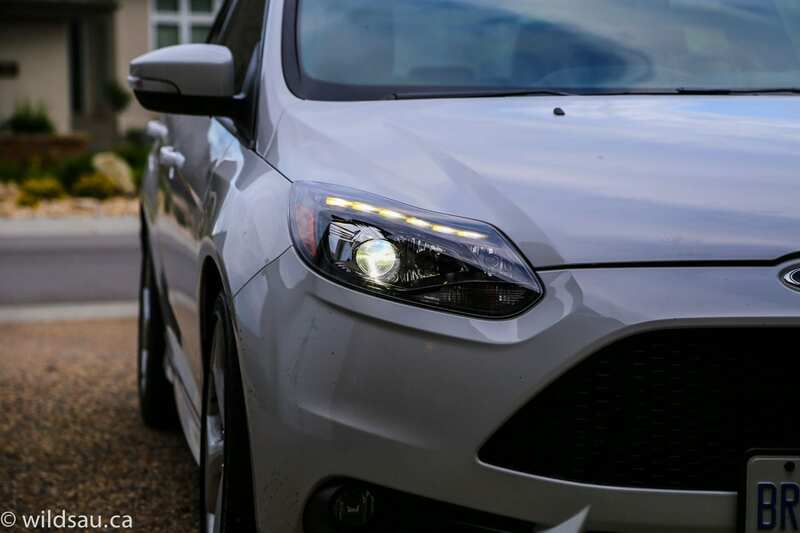 There’s plenty of backlit areas throughout the Focus, which is pretty neat to start with. 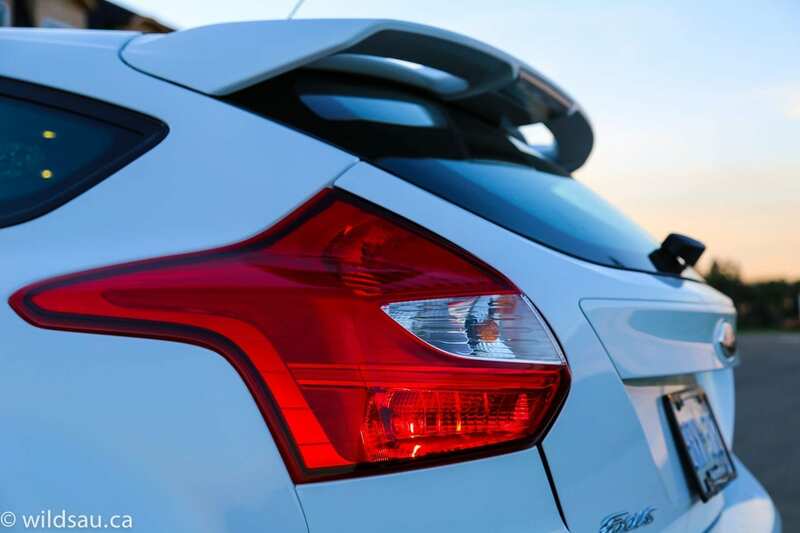 Typical for recent Fords, the Focus allows you to change the color of the backlighting. My kids loved that. I already touched on this in my first paragraph. This car is a blast! I loved almost everything about it when it comes to driving it and living with it. Big fat torque, incredibly balanced handling and a willingness to play, comfortable and supportive seats and enough cargo capacity. 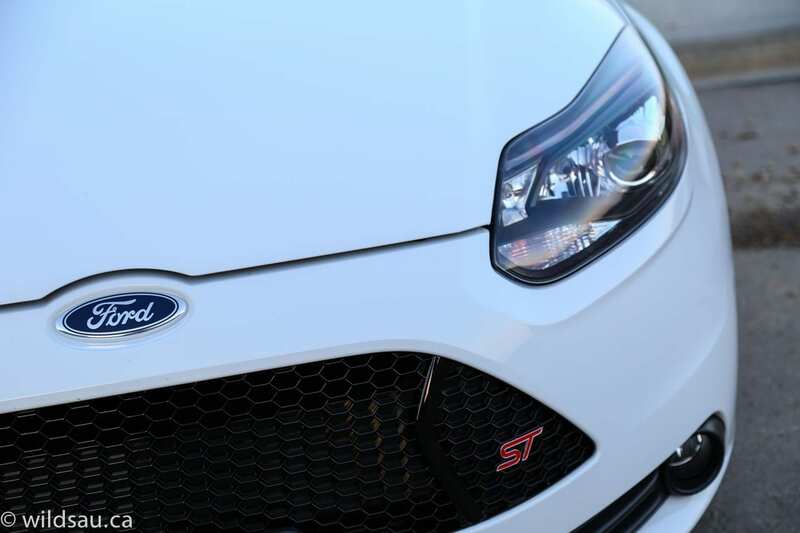 It’s a solid recipe for entertainment and the truth is the Ford Focus ST is without question the most fun I’ve ever had in a front-wheel drive car. WAF (Wife Acceptance Factor) is limited to a passenger’s perspective since she doesn’t drive manuals. 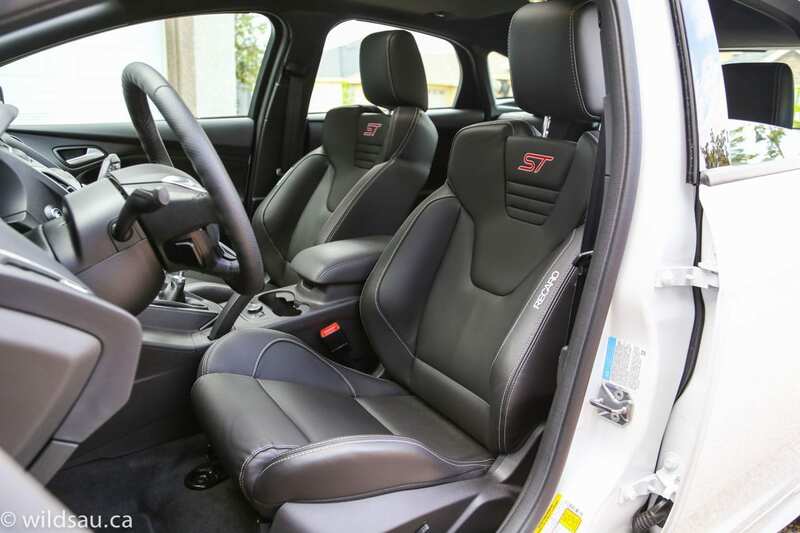 She liked the seats, the exterior styling and the color. She didn’t like that I had a tough time making every 1-2 shift smooth and started getting motion sick. This is why I don’t take her for along for some of the faster drives. So what’s the competition here? The two most obvious are the VW GTI and the Mazda Mazdaspeed 3. It might strike you as a different kind of car, but I’d also cross-shop the Subaru WRX in this category. All are pretty cool cars. The Mazdaspeed 3 is as fast as the ST, but is way too rough on the road and the power is irritatingly ON or OFF. No in-between. The GTI feels a bit underpowered in comparison here, and can’t keep up to the ST in corners either. The WRX’s strength, which matters greatly to me, is its incredibly potent all-wheel drive. 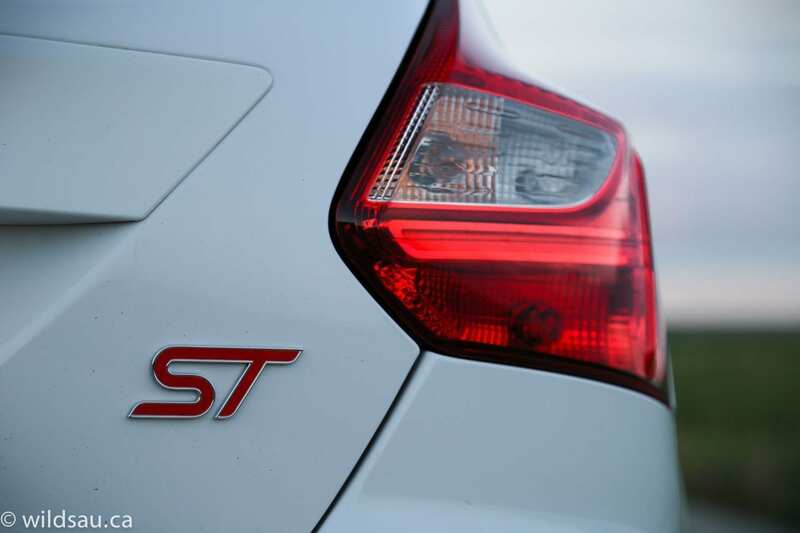 They’re all cool cars, but none are as fun as the Focus ST. The one caveat is that I drove it during the half of the year where we don’t have snow. I’m not sure what you’d do with all that power to the front-end in an Edmonton winter. Good tires or not, it might be a bit of a nightmare.